Afternoon of June 13, Yao Yanchen, Deputy Director of the Jining Bureau of Commerce, Xu Guoming, Section Director of the Bureau of Commerce E-commerce Department and other leaders accompanied by High-tech Zone Comprehensive Bonded Area Administrative Committee Director, E Commercial Department Director Wu Jingguo, Bin He Science and Technology Park Deputy Director Lan Tian and other leaders to visit China Transport Group for investigation on our Group's e-commerce, cross-border e-commerce, e-commerce personnel training, agricultural e-commerce, science and technology information and others. 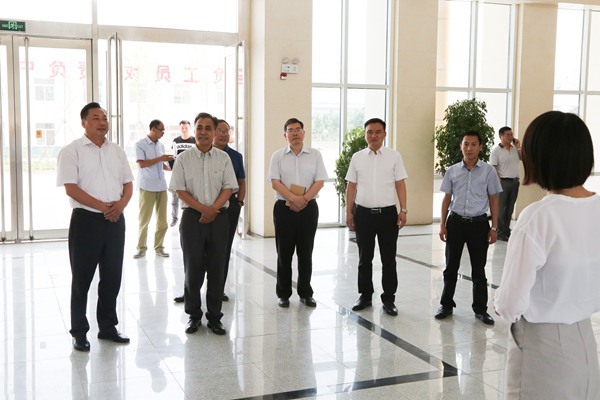 China Transport Group Executive Deputy General Manager Han Yong, Li Zhenbo, Deputy General Manager Sun Shijun, Guan Chenghui and other leaders accompanied reception. 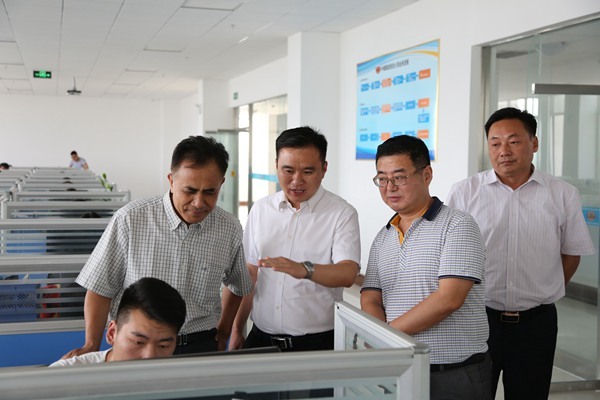 Accompanied by China Transport Group Executive Deputy General Manager Han and Li, leaders visited the new office building, E-Commerce Company, Cross-Border E-Commerce Company, Network Information Company, Software Technology Company, Weixin Agriculture Technology Company, Kate Intelligent Robot Company, Intelligent Equipment Exhibition Hall, etc., Manager Li made a detailed introduction on the China Transport Group overall development in the past few years to the visitors. Deputy Director Yao and other leaders gave a high degree of evaluation and recognition to the development achievements of our Group on the e-commerce, cross-border e-commerce, software research and development, e-commerce business personnel training and other aspects, unanimously high admiration to our Group that always adhere to multi-industry, high-level, global development strategy! He stressed that the municipal government attaches great importance to the development of e-commerce in the city, the e-commerce as a governmental No.1 project, as an important pillar industry to carry out key nurture, 2016, China Transport Group as e-commerce development Bench marking enterprise of Jining City, Shandong Province and MIIT, greatly promoted the development of the city's e-commerce takeoff, has made outstanding contributions to the city's e-commerce transformation and development, the next step, hope that China Transport Group to strengthen policy docking, seize the opportunity to give full play to the leading role of leading e-commerce enterprise, make new successful achievement of the e-commerce, technological innovation, personnel training and other areas in 2017! At the same time, Director Yao further clear that Will increase the city's e-commerce business support policy, so that make more enterprises bigger and stronger in the field of e-commerce! Manager Han said very grateful to the Bureau of Commerce leaders came to visit China Transport Group many times for guide the work, which is a high degree of recognition of our development results, also encourage and encourage to China Transport Group. The next step, we must actively respond to the call of the municipal government, and actively improve the function of the six e-commerce platform, through Jining Industry and Information Commercial Vocational Training School to promote successful experience of the China Transport Group to the community to help more enterprises embarked on the development of e-commerce, do better for the city's economic development!